Sexual harassment isn’t something that just happens in Hollywood, in the halls of Congress, and major television networks. It happens close to home, no matter where home is. This past week, a local actress friend posted about a Kansas City theater writer/producer who harassed her by private Facebook messages. She posted screenshots of his objectionable language and inappropriate suggestions. And then she talked about how this had started years ago, paused, and started up again. Then other women shared their experiences about the same man. After dozens of women shared specific incidents about this person, another person contributes information about a longtime Facebook page dedicated to this man for women to post their complaints about his behavior. A sexual predator hiding behind legitimate business practices. Sound familiar? But the kicker for me was when a male Facebook friend joined in on the conversation, questioning whether the problem with the producer should have been posted in the first place. I understand the concern people have for the safety of women who call men out. And for people who don’t find social media the ideal way to address a problem. Also, I’m not of the philosophy that every accusation by a woman means it’s true. And, of course, I believe in actual due process over execution by the court of public opinion based on unsubstantiated facts. But in any of these ever surfacing situations, how much are we supposed to cover up when dozens of women share stories of the same men engaging in specific and disgusting patterns of behavior? For some, these recent national and local allegations are shocking and overwhelming because they have been lucky enough to not have any personal nexus to those experiences. For others, it triggers their own harassments, their own assaults, and the reported, unreported and disbelieved incidents from their past that they believed were in the past. But a discomfort with the subject matter — or the place of the conversation — shouldn’t mute the conversation. It makes me realize that men, particularly powerful men, just aren’t used to being under attack. After all, it’s one thing when most of the serial killers are men. Or most of the mass shooters. Or most of the perpetrators of domestic violence. But this whole harassment and assault “thing” really seems to be upsetting the relative safety of being a man in society. At least that’s how some men look at it. It seems to me that many men really are genuinely afraid about how their past behaviors, in a context they never comprehended, might catch up to them. Especially when that behavior is a first cousin to the behavior people write romantic comedies about. Being persistent in asking out the cute “girl” who walks down the hall is encouraged. But did the cute girl and her friends consider it borderline stalking? Flirting at work may be how you met your wife or girlfriend or husband or boyfriend. But how did people who you didn’t end up in a relationship with feel about your flirting? Commenting on physical appearances. Sure, some professions like theater or film require this as part of the decision making process. But when are they inappropriate? 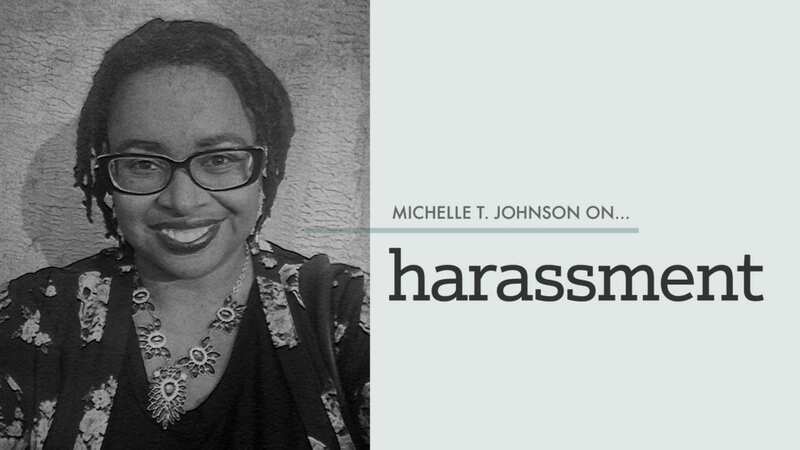 However you define harassment, if all this heightened talk about it finds you feeling mildly defensive or making blanket comments about the victims, this might be the time to ask yourself what you may be just a little worried about from your past. Or your present.